Fast Shutter Or Slow Shutter? Below is a photo of a fountain in the popular Bedford park. Each photo was taken in exactly the same position and focal length and aperture. The only difference is the shutter speed of the camera, which gives very different results. Which do you prefer, fast (top) or slow (bottom)? Find out below what is involved with these very two different techniques. So above obviously two very different interpretations of the same subject. Firstly, with the top version, the aim is to freeze the action. In this case the action is the water fountain and to show as much detail in the spray as possible. 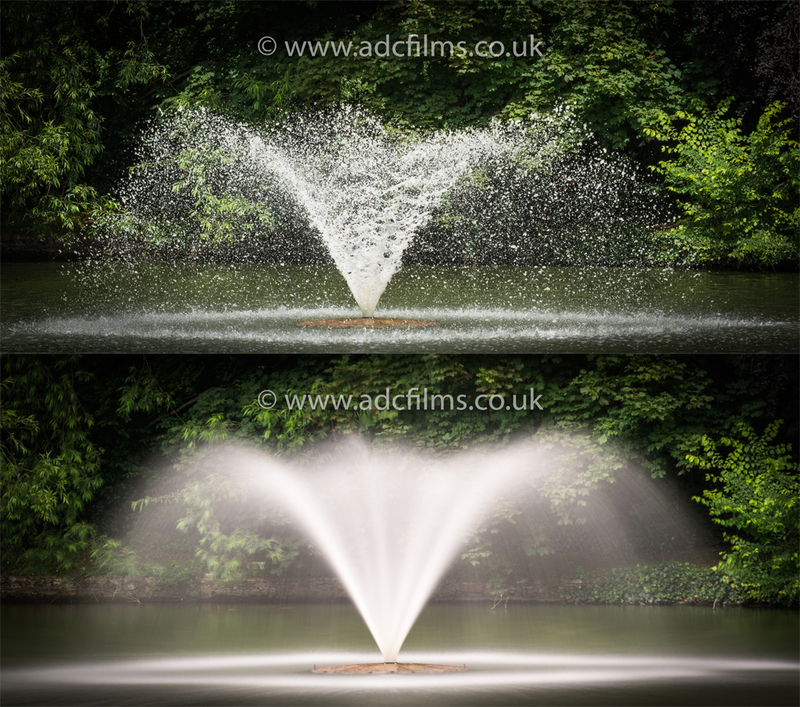 As the water is being sprayed at such high speed then a high shutter speed (typically above 500) is vital to achieve the required look. To achieve the look of the second photo takes more planning than the first. This is because in order to get the surreal effect of silky water, it requires a very long shutter speed (typically at least 20 seconds). However this is not as simple as dialling in a shutter speed (as in the first photo) as in order to get a slow shutter speed in daytime (typically above two seconds) then it is necessary to put a neutral density filter on the lens. This filter basically acts as sunglasses to your lens and depending on which strength you use can reduce light hitting the camera by over 1000 times! Choosing the right one takes practice and experience of the scene. I knew I wanted a shutter speed of around 50 seconds for this shot so I went with an ND10. As I had already locked the focus from the fast shutter version the only thing to do was to hit the self timer (to avoid camera shake) and wait for the camera to do its stuff. Finally it was then over to photo editing software to make some minor adjustments to shadows and highlights and finally ending the edit by adding a vignette, which darkens the corners of the frame and adds to further draw the viewers eye to the middle of the frame where the subject is. We put these two pictures on facebook and asked a large local Bedford group to comment which they preferred more. On last checking it seemed it was about equal, this shows just how individual photography is to people and therefore the importance from a commercial level on always finding out exactly what a client wants, whether that be videography or photography. The same scene can be shot many different ways!